Almost a week ago I introduced Pandora my own take on Inversion of Control. So I’m back to report some news. Before only one service registration was possible, preventing you from doing all sorts of cool things. You don’t need three registrations for this, only one since every subresolving of IService will happen on it’s own. Something that isn’t really practical actually since we still lack the ability to influence the resolve process. 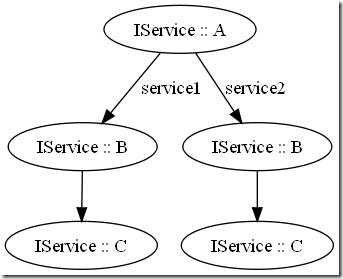 Both IServices will be populated by the same registered type, it just won’t be the parent IService again. I also spent almost the whole day refactoring the resolver code since I felt that it became quickly unreadable. I still feel like the resolver needs some more refactoring, and I also want to improve the error messages. After that, I’d like to return my focus back to much needed features like lookup strategies and after that auto-configuration. You can check out the code on the project site on bitbucket.